The CMA CGM Group, a worldwide leading shipping group, is pleased to announce the union, from April 1st, 2019, of its Containerships and MacAndrews brands under the single Containerships brand. 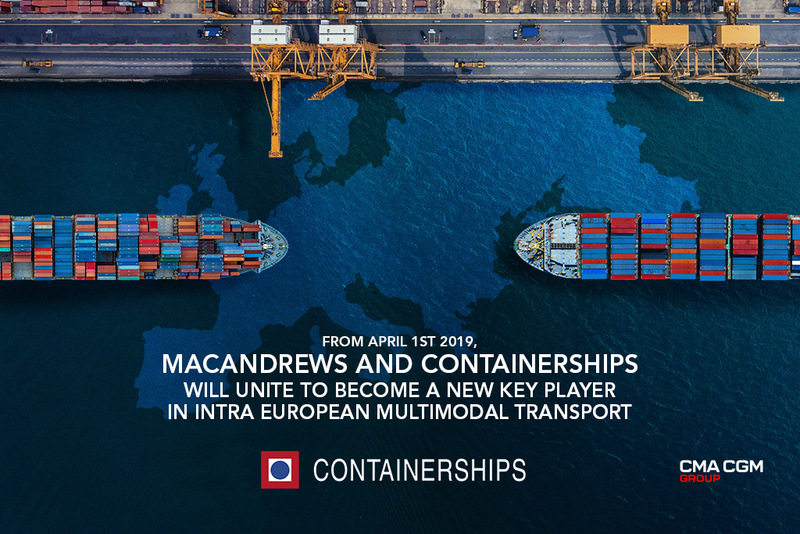 By joining the forces of two recognized experts of intra-European multimodal transport, the CMA CGM Group will create and develop an Intra-European leading brand, combining unique maritime and inland solutions with complementary regional footprints. This new, innovative single brand will thus be able to unlock major synergies and concentrate its resources on commercial growth and on the development of high quality services for its customers. The integration of the local agencies networks will also allow for the creation of a tailored intra-regional service, in line with the CMA CGM Group’s “Customer Centricity” strategy. Also equipped with a fleet of LNG-powered trucks, Containerships is therefore able to offer LNG at each step of the transportation process. This capacity will be further boosted in the coming months with the delivery of new 1,400-TEU (Twenty-foot equivalent units) LNG-powered container ships, and from 2020 with the integration in the CMA CGM fleet of nine 22,000 TEU vessels propelled by LNG. The use of LNG represents a real technological breakthrough which allows for up to 99% less sulphur and fine particles emissions, 85% less nitrogen oxides emissions and 25% less CO2 emissions as compared to heavy fuel oil.